Welcome to the tourist nature trail that will introduce you to a colourful history of the extinct mountain village Bludná and its surroundings. You will walk along the ancient country border, will be able to see the beauty of upland peat bog and go to places where ores of tin and iron were mined heavily in the past. The route is led mostly on groomed forest roads and is a continuation of the Mountain nature trail Hřebečná which thus gets connected into an integrated circuit. The Natural trail Bludná itself has 10 stops and is 8 km long which can be comfortably walked in 3-4 hours. Nature Reserve Ryžovna. On an area of 20 hectares, there are preserved unique groupings of mountain plants and relics of old beech forests, which are found mainly on the northern edge of the basalt hillock. At the top of the ridge after World War 2, a radio watchtower was created and remained active until the 70s. Upland peat bog and heath Spáleniště. South of the road on the mountain plateau of the Ore Mountains at an altitude of about 1000 meters, there you can find a large complex of waterlogged mountain meadows, heaths and peaty lakes with typical vegetation of dwarf mountain pines, heather, bilberries, crowberries, cottongrass and other, often rare and protected mountain plants. Historical provincial border. Over this place until the mid-16th century, the border line between the Bohemian kingdom and Saxony, or more precisely the dominion of the Counts Šlik in the south and the territory belonging to the Elector of Saxony in the north, was running. Old tin mines. Romantic remains of surface tin mine Drahá kožešina (Costly fur), in which cassiterite was mined from the steep cassiterite greisen deposits even in the early 19th century. Iron-ore mine Pomoc Boží (God´s Help). Once the biggest iron-ore mine near Horní Blatná, which was functional from the 16th to the late 19th century and even shortly during the First World War. Blatná water ditch. 13 km long ditch bringing water for mines and finishing facilities from Boží Dar to Horní Blatná, a unique technical monument from mid-16th century. Water from the ditch was used by most of the mines in Bludná, especially to drive water wheels and stamping mills. Bludná. An extinct mining village, in the 16th to 19th centuries an important centre for mining of tin and iron ore. It lies in the area of so-called Bludenská geological disorder - a huge fault zone of NW-SE direction and length of approximately 18 km. Červená jáma (Red pitch). The gigantic dip in place of old tin mines from 16th to 18th centuries, the largest of its kind in the country. Main elliptically elongated line of the NE-SW direction has a length of 230 m, a width of about 30 m and a depth over 20 meters. Lesík. Half-extinct village, originally called Dolní Bludná, received its later name after Lessig family which lived here since the 17th century. Significant spring area from which water is brought by a unique technical construction to Abertamy urban water supply system built in 1909. Uranium mine Jeroným. The last active uranium mine in the Jáchymov district closed in 1965. Uraninite was mined here from the depth of almost 500 meters. A huge waste-heap still recalls the extent of mining. The route is not marked in the terrain, so be sure to take the tourist map or GPS with you. 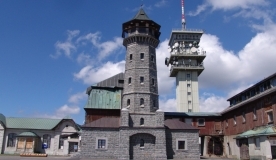 The official website of the town Boží Dar provides information about this important tourist centre and its surroundings. Boží Dar offers a wide range of activities throughout the year and thanks to the ideal conditions invites you to spend an active holiday in the Ore Mountains. Copyright © 2019 Boží Dar. All Rights Reserved. Některé fotografie na tomto webu byly použity z kvpoint.cz.